Ever wish you could have more hot water but didn’t want a bigger, bulkier, heavier water heater? Provides the equivalent of 16 gallons of hot water in a 10 gallon size by heating cold water to a hotter temperature and then mixing it with more cold water through an already installed mixing valve on the rear. The result is 50% more hot water! Easily installed in the same cut-out dimension of an existing Atwood 10 gallon water heater. Features pre-installed winterizing by-pass kit. Save Money—The Atwood XT comes pre-configured for installation with a winterizing bypass capability. 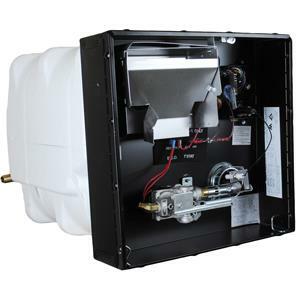 The Atwood XT can also be installed in the same cut-out space as the current, popular Atwood Water Heater, saving the expense of having to redesign coaches to accommodate for bigger, bulkier, heavier water heaters. Save Time—The Atwood XT pre-configured winterizing capability eliminates one additional, time-consuming installation step. The valve, hose, tee, and thermostatically-controlled mixing valve, with a check valve and a cold water passage, allows you to isolate and drain the tank and pump antifreeze through the plumbing circuit. Because Atwood has greatly increased hot water output while maintaining the size and weight of the water heater, one can simply install the Atwood XT in the same cut-out dimension that they have grown accustomed! Save Space—Atwood’s Exothermal Technology has increased the hot water output of the Atwood XT Water Heater, not the size of the water heater! While some manufacturers are trying to provide additional hot water by creating bigger, bulkier, heavier water heaters, Atwood provides a more efficient solution. Operates on LP gas or Electric 110V with DSI electronic ignition. Cutout dimensions: 15-3/4"H x 16-1/4"W x 21-3/4"D.